Hummus never gets old! And this version, while really should be saved for Halloween, comes in handy during the Great Lent (vegan) fasting period. My friend and fellow Portland expat @CamilleBeGreen made black sesame tahini and gifted me a jar of it. This was something very special - never had I seen black tahini available for purchase nor had I ever dreamed of it. I had to make hummus with some of it and didn't want the color to fade with standard chickpeas. 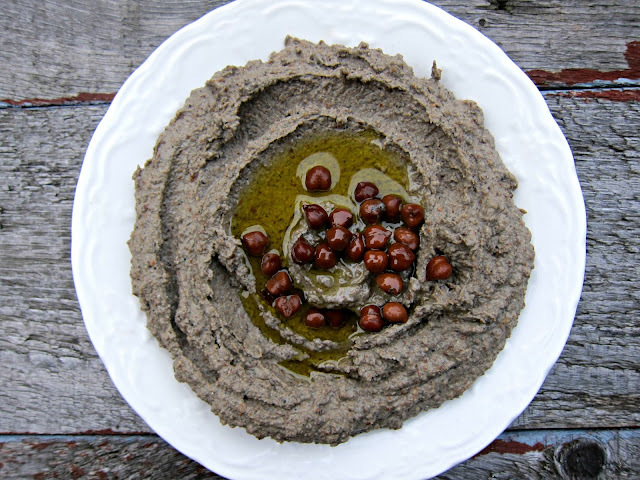 While I could have used black beans to make this hummus, I wanted to stay classical and use black chickpeas. The best I could find without ordering online were these green looking "black chickpeas" from Whole Foods bulk. I was hoping the'd somehow become black during the cooking process - but brunette it was! The black chickpeas have thicker skins, creating more of a grittier hummus, which is no biggie for me (still have not tried the hand-shucked etherally smooth version yet). One side note for the future, if you truly want black on black on black hummus, add squid ink! In a food processor, blend everything but the chickpeas together until smooth. Add the chickpeas and continue to pulse until smooth, add more olive oil or bean liquor to get to desired consistency. Serve in a bowl, sprinkles some extra chickpeas and drizzle with extra virgin olive oil. Didn't even know there is black tahini or black chickpeas! It sounds amazing and surely would like to try it. Ivy - I hadn't until just a few months ago - word travels fast! Anna - Nice to meet you and meet a fellow Anna! Love your blog! Never heard of black chickpeas.I would love to try your hummus,dear Anna!Filakia apo Ellada!